San Francisco Mayor Ed Lee has made good on his threat to veto legislation that would have deprioritized ticketing cyclists who safely roll through stop signs. "This ordinance does not promote balanced public safety for all the diverse users of our streets, rather, it trades safety for convenience," the mayor wrote in a veto letter yesterday to the Board of Supervisors. The board passed the policy, which would have made cyclists yielding at stop signs a low traffic enforcement priority, in a 6-5 vote last month. That wasn't enough to override Lee's expected veto. Supervisor John Avalos, author of "San Francisco's Right-of-Way Policy," and bike advocates had argued that the San Francisco Police Department should use its scarce traffic enforcement resources to target dangerous drivers, who are responsible for causing the majority of deaths and injuries on the streets. 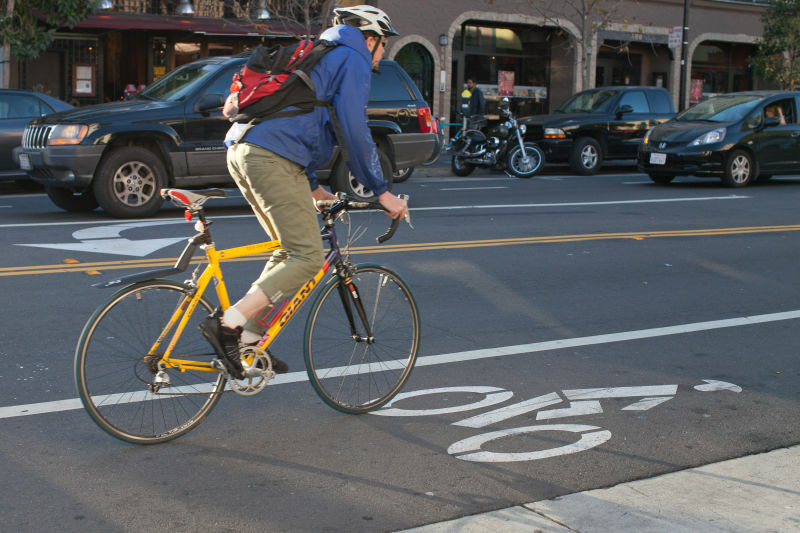 The legislation was born out of a continuing crackdown on bicyclists who roll through stop signs along The Wiggle, one of the city's most popular bike routes, which is flat and zigzags from Market Street to Golden Gate Park. A bike commuter's public records act request revealed police dedicated 114 enforcement hours to a two-day August crackdown of bicyclists along The Wiggle, but didn't do any enforcement around the city's most dangerous intersection for bicyclists, Market and Octavia streets. Advocates from the San Francisco Bicycle Coalition called the veto of "smarter enforcement" a "major step away" from Vision Zero, the city's program and goal to end all traffic deaths by 2024. "Faced with this opportunity to hold the SFPD to their promises and move San Francisco towards Vision Zero, Mayor Lee dishonored the lives lost in San Francisco crashes, calling data-driven enforcement a mere 'convenience,' " said a statement from the SFBC. Police have promised to focus on the five most dangerous intersections and violations in their respective districts. The Police Department, along with other city agencies, opposed the legislation. "It is unacceptable to encourage someone to break a law that could result in injury or death because it is 'inconvenient' for the driver/bicyclist to come to a complete stop. All vehicles shall stop at a stop sign -- period," Police Chief Greg Suhr wrote in a letter to the Board of Supervisors. Advocates for people with disabilities had been some of the most outspoken opponents of the legislation, arguing that it could have been counterproductive to Vision Zero, potentially endangering pedestrians. The city's pedestrian advocacy organization, Walk San Francisco, took a neutral stand. Jeremy Pollock, an aide to Avalos, said they plan on working to craft a pilot program, which seemed to draw support from Supervisor Malia Cohen, who opposed the ordinance, along with the head of the Mayor's Disability Council. Bike advocates say many cyclists already safely travel through intersections without coming to a complete stop. The law would not have prevented or discouraged police from ticketing cyclists, who would have still needed to yield the right of way to people walking or driving.